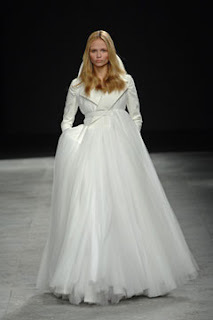 Here are some beautiful photos for wedding dress design inspiration. 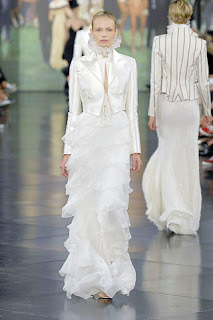 My favourites are the dress by Melvin Lam, and the one worn by Kübra Gül. Which ones do you prefer? I like Hanan Turks, and Ghul's okay, but I'm not really loving any of them. That days gotta be special. about weddings.. yes, that days gotta be special.. but the years and years to come afterwards need to be more special inchaAllah, the wedding is not even 1% of the life u and ur chosen 1 inchaAllah will have... The real expences come AFTER the marriage, trust me. I never did get the point of spending and spending for 1 day.. make it special be beeing creative is my point of view, make it special by the people u have there.. u know.. now, I'm turkish, and a muslima. I dont think its right that women in my country spends a fortune on those silk hijabs, a fortune just to look chic.. i like looking good too, dont get me wrong.. but to spend all that much on outer looks does not, in my view, have a place in islam.. Allah loves beauty, but he also told us tabdir is not good. Mr Güls family are alhamdolillah wealthy.. and I remember all the fuss when his daughter got married.. we have to answer for every penny the day we inchaAllah meet our Creator Allah taala.. i mean, he could make the wedding a little less expencive.. and send 10.. even 5 misakin for hajj? i mean why not?.. isnt that a reward worth stribing for? Islam should remind us that tabdir is something we should try to stay away from.. in every aspect of life. I love the turkish president's wife's dress. (whew!). I think its gorgeous. My wedding day, which was a year and a half a go was beautiful. A morraccan friend of my mom's made the perfect empirical jacket over the dress. I also had the big "head" because of the hair underneath the scarf. But I decided to put a crown on top to create an actual look, not a big mass of white hijab. I also used my mother's viel, with a little additions we sewed on ourselves. Yes, it is one day! But it was a great beginning to a wonderful experience. As long as you are happy and not overindulgent, I think it's perfectly fine to celebrate it. You can have it anywhere, in any price dress and still create a beautiful look and atmosphere. ooh i really liek the dresses, i do think we need more on dresses and perhaps a bit on where to buy them from. im looking for dresses at the moment andi live smack bang in the middle of the country side in west wiltshire, and as you can guess no muslism for miles let alone muslim bridal shops, and on teh interenet i cant find any nice sites. Salam sisters! I don't want to start a discussion, but weddings are cause for celebration. Even our blessed Prophet (pbuh) told us to be cheerful and celebrate a blessed marriage. Or am I wrong? And we are all entitled to live within our means. If we have the money to spend, we should not have to live like paupers to show our piety...there is a hadith pertaining to this as well. There is a difference between extravagance and allowing yourself to enjoy what you were entitled to for the sake of Allah. We are commanded to celebrate with a wedding and a walima for good reason, are we not? Dear Sister Hayah, I love your blog and have been a silent reader for a long time. I just felt that I had to reply. I am deshi, and it's hard to find a similar wedding hijab style in red...but that's culture coming into play. Thanks for all that you do. Just want to give Kudos the the Turkish PM for defending the the right to wear hijab over there, and wish his daughter a wonderful life Inshallah. Muslimah 1, I don't think Alix was referring to the cost of the dress, more the design. I'm sure all of these ones cost a lot of money, but a dress doesn't need to be very expensive to be beautiful! 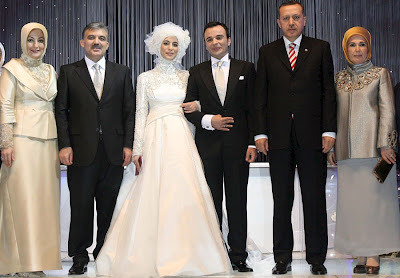 Anon 1 it's actually the Turkish President's daughter's dress hehe :P. Your dress sounds beautiful mashallah. Unfortunately it's the only one I know of in the UK, but I'll keep searching! Another option is to buy a full-length dress and wear a matching bolero over it, like the one in the first picture. You could probably find one in a regular bridal shop, or get one tailor made. Farhana, thanks! You're right in that we should live within out means, and not be extravagant. I personally don't like the idea of spending thousands of pounds on a dress that is after all, going to be worn for a few hours, and then packed away. You hear of some people who will take out huge loans just to throw the most expensive weddings they can - and then end up in debt for the rest of their married life! As for dresses, I think it's tacky to be covered in Swarovski crystals from head to toe with an enormous meringue skirt and a few kilos of fabric on your head, all at the same time! After all, the wedding is about you, and not your dress! I like Kubra's because it's not too much, but I would have done a little more on the botton half of the dress. Asalam wa3laykum ladies!! Im getting married Inshallah and i was wondering if someone can please direct me to any sites or magazines or anything where i can find hijabi head pieces?? i cant find enough on google and i dont know where to look!!!!!!! help please!!!! THANK YOU!!!!! I'm dreaming have a wedding like this one. we are muslims we have to practise our religion anywhen and anywhere without caring about words of others. Mariage is only a ceremony ver the father or the wali catchs up the gals hand and give to someone whom he trusts... the real lyf starts after .... the bride and groom shud be preparing on how to adjust a new atmosphere and be patient vid each other... more than they preparing for the ceremony ....jus for one dayy!!! i hav also read some wer about this... but donno vhich hadith People should avoid spending extravagantly or going to extremes in showing off in wedding parties, because that may wipe out the blessing.